I spend way too much time talking about stuff that bugs me, but after getting mugged by Ticketmaster and Tropical Storm Hannah at a big-name show last Saturday, the trend seemed ready to continue. Paying 300 bucks for seats in the rain makes me cranky, though I have to say that the parking lot party was fantastic. But when I left the show soggy and in a mood it looked like Great Woods (Tweeter, Comcast or whatever that shed in Western Massachusetts is called – the name changes like New England weather) was in for a slagging. Then I heard Sugarland’s cover of “Come On Get Higher” and it made me smile and forget. Great music does that. Sometimes it takes another artist to bring a song to life, like when Jose Feliciano exposed the Doors’ “Light My Fire” in 1968. At the Johnny Cash memorial concert in 2003, Marty Stuart’s churning version of “Rock Island Line” made me a fan. But it was Kid Rock’s revelatory take of “What is Truth” that really moved me. The cross-pollination of country and rock – call it the “Crossroads” effect – gets better every day. It’s best when established stars bring lesser-known players into the spotlight. Sugarland got a career boost when Jon Bon Jovi invited Jennifer Nettles to sing on his record. Now, with sold-out shows and a number one album, the band is paying it forward by releasing a live take of Matt Nathanson’s spirited ballad. The original version is great, but the buoyant, romantic song calls out for a bit of twang. Throw in a little harp and harmony, and it was like hearing it for the first time. 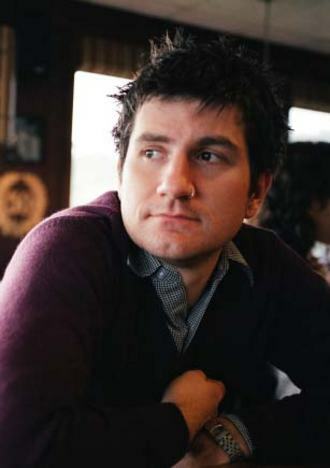 That song, a “Love on the Inside – Deluxe Fan Edition” bonus cut, made me seek out Nathanson’s other work, which one writer said evokes “a new human emotion known as ‘craffing’” – crying and laughing at the same time. He shares that trait with other singer/songwriters – Jason Mraz, David Gray and Steve Poltz come to mind. But Matt Nathanson probably invented it. And right when I needed him, he cured my angry blues. See, that’s the thing. When I’m ready to explode like some Roger Rabbit extra with steam coming out of his ears, something happens to remind me why I love music. It’s a paradox – while the business is a horror show, there’s so much great music it’s almost impossible to keep up. But keep trying. It’s hard work, but worth it. Thursday: Terry Diers, Salt Hill Pub – Blues night at Salt Hill with a guy who’s like a lot of Upper Valley musicians – it’s hard to keep track of all the bands he’s in. Tonight Terry keeps it down and dirty with a few of his friends, but on other occasions he rocks it up with Skinx, goes Celtic with Samantha Moffatt (who’s at the Farmer’s Market this afternoon), or plays solo. Thursday Blues runs through October 22. Friday: Kelly Ravin, Canoe Club – Another intriguing singer-songwriter at this fun (and typically on Friday night, crowded) Hanover eatery. You know the drill – finagle a table close to the stage so you can hear this guy, who sings a bit like Damien Rice or Jeffrey Foucault, and writes spare, storytelling songs. Before going solo, Ravin played with the Burlington band Lucy Vincent. Every few weeks CC books a gem, and this could well be another. Saturday: Adrienne Young/Olabelle, Tunbridge World’s Fair – This upcountry fair, now in its 137th year, features bluegrass from Young, a serious picker with a great voice, and bluesy Americana from Olabelle, which includes Levon Helm’s daughter Amy. Along with some great guests (Gilliam Welch, David Rawlins, Calexico), Levon and Amy played a fantastic set at last month’s Newport Folk Festival. Sunday: Acoustic Open Stage, Umpleby’s Bakery – Cakes aren’t the only thing great about this Hanover bakery, located a stone’s throw from downtown on South Street. This open mike sounds like an audition for future music – I certainly hope so. I love the vibe here, a cozy alternative to Starbucks that knows how to treat a sweet tooth. Tuesday: Jackson Browne, Orpheum – He’s probably my favorite singer-songwriter, as much for commitment and integrity as music. Over the past several years, Jackson’s played solo, releasing a pair of unplugged recordings. But with a new album due soon (“Time the Conqueror”), he’s back on the road with a full band. Unfortunately, this Boston show is the closest he’ll get to here (though you can watch him on the Colbert Report September 23). Wednesday: Tomatoes on the Terrace, Hanover Inn – No music here, but plenty of tomatoes – a contest for area growers sponsored by the Upper Valley Slow Food Convivium. Prizes will be awarded for best looking, most surprising, biggest, smallest, and of course, best tasting. To a casual fan, “I Got The Feelin’ – James Brown in The ‘60s” might appear to be just another DVD box set of greatest hits and rarities. But the innocuous cover art (the “Godfather of Soul” singing in a three piece checked suit) masks a stunning historical document contained inside. 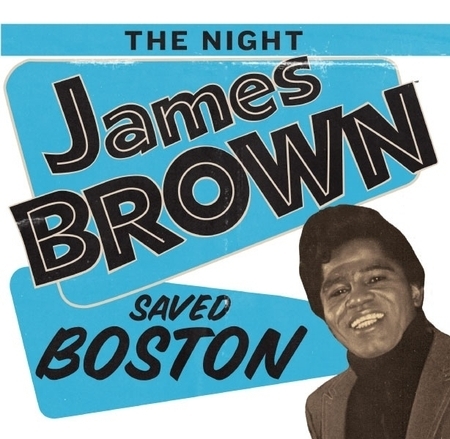 The centerpiece of the 3-disc set is “The Night James Brown Saved Boston,” a documentary that premiered last spring at Boston’s Museum of Fine Arts. The film chronicles the city’s response to the murder of Dr. Martin Luther King on April 4, 1968. Music fans have long heard of how, on a terrible night, during one of the worst years of the 20th century, a televised James Brown concert kept the flames raging across the country from reaching Boston. Over 100 American cities burned. 40 people died, and scores more were injured. Yet Boston emerged for the most part unscathed. While James Brown may not have accomplished that feat alone, it would not have happened without him. The box set gives context to those events, with David Leaf’s excellent documentary, extended interviews of key figures, and most importantly, the elusive black and white tape of the concert, as raw as the night itself must have been. The set inexplicably includes a third disc containing a 1968 television special filmed at Harlem’s Apollo Theatre a few weeks before King’s murder. Leaf tells two stories in his documentary – one of how the concert happened, and another of the role the event played in Brown’s emergence as an important leader in the black community. Brown, a close friend of Dr. King, was scheduled to perform at Boston Garden on April 5, one day after King was shot by a sniper in Memphis. When the mostly-black enclave of Roxbury erupted in rioting on the night of the civil rights leader’s death, city officials at first considered canceling the event. City councilor Thomas Adkins, Boston’s first elected black official, persuaded new mayor Kevin White to use the concert as a way to calm the city. White then convinced WGBH, the local PBS station, to televise the show as a memorial to Dr. King. Adkins tackled the task of calming Brown, who stood to lose a lot of money from refunded tickets. Eventually, the city agreed to pay him $60,000, though Brown’s long time manager says in the film that the singer never saw the cash. The live broadcast was a formidable challenge. “When they said ‘a James Brown concert at the ‘Gah-den’, they might well have told us to take ice samples of the moon,” says show director Russ Morash of staid WGBH. Using equipment better suited to symphony broadcasts, technical difficulties delayed the program’s start by an hour. Brown cooled the mood considerably when he grabbed the microphone from Adkins, who’d begun to introduce White, to greet the Mayor himself. “He told me not to call him your honor, he said ‘I’m all together’ – he’s a swingin’ cat,” says Brown. Brown gave a masterful performance, something the full-length DVD of the concert bears out. Though the sound is a bit dodgy, recorded long before high fidelity television was commonplace, it’s clear that James Brown was at the peak of his talent that night. David Gates calls it “the crucial moment,” which could have erupted into something much worse. “It would have gone up like a torch,” he said. The day after the show, Brown was in Washington, D.C. urging black citizens of the riot-torn city to “please go off the streets.” He repeated the effort in a series of “Learn, Don’t Burn” appearances across the country during the ensuing days and weeks. Later that summer, he flew to Vietnam, literally dodging bullets to perform for the troops – the first black headliner to do so. On April 5, 1968 at the Boston Garden, says Rev. Al Sharpton, James Brown admittedly channeled black America’s rage “into a show business performance. But he also made the choice that it was the only thing he could do to show respect to Dr. King and to save people’s lives that night” – even as some critics accused him of trivializing King’s murder by playing a concert. When someone creates a musical Mount Rushmore, Pete Seeger’s face will be on it. There’s probably not a soul alive who doesn’t know at least one of his songs, like “If I Had A Hammer” or “Where Have All The Flowers Gone?” He’s been named a Living Legend by the Library of Congress, inducted into the Rock and Roll Hall of Fame, and been given a Grammy Lifetime Achievement award. Not many folksingers can make that claim. Bruce Springsteen devoted an album (“The Seeger Sessions”) and a world tour to the man and his music. After a career that began before World War II, it might seem he’d be ready to relax and enjoy a few tribute concerts – from the audience. But apart from a pared-back schedule, he shows no signs of slowing down. Seeger has a new album due out September 30, called (fittingly) “At 89.” Accompanied by his grandson, Tao Rodriguez-Seeger, and bluesman Guy Davis, Seeger will perform three shows in the region this weekend, all benefits. The mini-tour stops at the Lebanon Opera House Friday, and will raise money for the New England Farm Relief Fund, an organization that’s also the beneficiary of Saturday’s (sold out) show at Brattleboro’s Latchis Theatre. New England Farm Relief funds micro-loans for small family farms. The small cash infusions help them transition between planting a crop and bringing it to market. Though little noticed, Seeger considers these, and similar community-level efforts a vital part of the nation’s fabric. The Lebanon show also benefits the Haven homeless shelter, and patrons are asked to donate a non-perishable item for their food pantry. Seeger is the sort of “community organizer” who gives sneering critics like Rudy Giuliani night sweats. 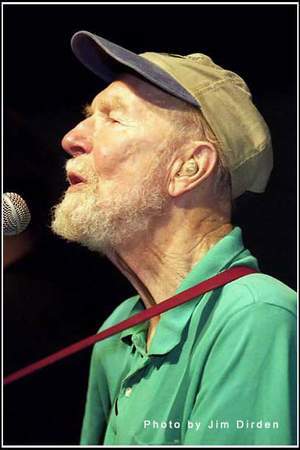 When he, and his band the Weavers, were blacklisted after the McCarthy hearings in 1956, Seeger fought a four-year court battle to stay out of jail – and emerged unrepentant. The controversial tune got him booted from CBS’s “Smothers Brothers Comedy Hour” in 1967, although he did perform it on a later show. The network had a policy forbidding “appeals for active support of any cause” – a quaint notion in today’s unregulated media world. In 1966, Seeger created the Hudson River Sloop Clearwater, a floating classroom devoted to waterway cleanup, which still operates in upstate New York.